If you are moving or working in the Shropshire area or towns of Shrewsbury, Telford, Market Drayton, Wem, Whitchurch, Ellesmere or Oswestry we can accommodate you. 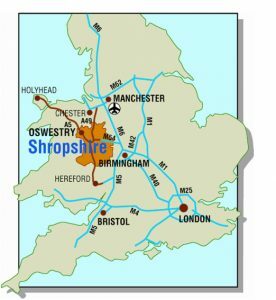 Shropshire is logistically good and friendly with roads, trains and airports exceptionally well linked. M54, M5, M6, and the M6 toll junctions are approximately 15 miles from Shrewsbury. Shrewsbury, North to Chester and Crewe, east to Telford and Birmingham, South to South Wales and Bristol and West to the Welsh coast. Birmingham, Manchester, Liverpool and East Midlands are approximately 1.5 hours away. Shropshire has beautiful open countryside …. Come and see. Newton Meadows Cottages are a central place to stay with large off road parking. Check it out, it’s got everything….